I think it's a great pattern, so my only change would be to make it scrappy. I like to make most everything scrappy. Everything scrappy is a good system. Thanks for visiting, Lisa Marie. Wouldn't a gradation of reds and oranges be gorgeous ( no white) to change up the Sun Dunes pattern if I were making it? I love sunsets, and the name for that quilt is wonderful! Her colors in the book are more reminiscent of a sunset. Thanks for visiting, Anita. Love your colors but I love taupe colors so I’d change to taupe background. Great idea! It's so easy to change up a pattern by substituting your favorite neutral. Thanks for visiting, Cathy. I love the pattern and your quilt. I make a lot of baby quilts for charity and the size would be perfect. As for what I would change, I guess the background color. The white looks great, but would use something with a little color and texture for use as a baby quilt. It's actually a light grey, but you're right that substituting something colorful would make a happy baby quilt. Thanks for visiting, Donna! I like how yours turned out. I think I would like to see it with a black background. That might be interesting. Ohh... that would be fun! Thanks for visiting, Sharon. I really like this. I haven't had a chance to do a thorough look through the book yet. Well done. That would be bold. :-) Thanks for visiting, Rita. 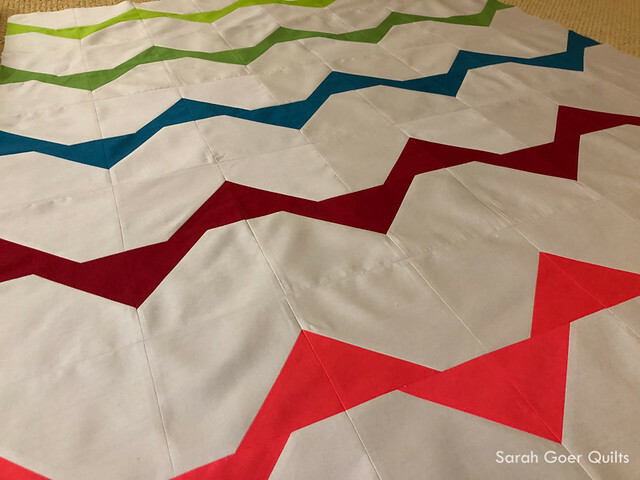 I'd like to try the quilt using an ombre fabric to see the color progression. When I read that a variety of shades of teal came to mind. :-) Thanks for visiting, Laura. I would probably use a lot of batik scraps on this one. Maybe blues. Would look like kites. This is such a scrap friendly pattern. It could be scrappy within each row. Thanks for visiting, Christi. I'm partial to other-than-white backgrounds so might go for greys with ocean colors like pale aqua, seafoam green etc. I realize my pale grey is coming off as white to some viewers. I favor greys as my preferred neutrals. A grey background would be lovely paired with ocean blues/greens. Thanks for visiting, Pamela. I would use a dark background and bright colors. That would really pop! Thanks for visiting, Sue. Would you use solids or black and white prints? Thanks for visiting, Sharon. I have some flower squares that would be great for this pattern and I would use a yellow or green triangle. Sounds like a lovely combination. Thank you for visiting, Rosalind. I might try it with some stripe fabric. There's a whole chapter in the book on using strips. They would be fun in this pattern! Thanks for visiting, Kathie. I'd like to try some plaids with a solid for the Sun Dunes. Someone else suggested stripes. Plaids would be another great, bold choice. Thanks for visiting, Barbara. Red and white would look nice. Or navy with white polka dots and solid white. Many choices would look good. Ohh... I love the idea of a polka dot. You're right... there are many choices. And commenters have had such great ideas to share! Thanks for visiting, Janet. Your quilt is awesome! I would try it with black instead of white to see how that that goes with the solid colors! A black background would be a great choice. I like the contrast with my light grey background, but I almost never use a background that is this light. ;-) Thanks for visiting, Dawn! Being a Southern California native, my initial thought upon seeing this pattern was that it reminded me of the beach, so I would start in sandy tans, then transition to foamy whites, deep ocean blues, then sky blues. Or maybe sunset colors above the ocean? I'd have to lay it out to see--that's where the fun is, right? That sounds like a beautiful option for this pattern. The beach and ocean are full of such great colors. Thanks for visiting, Beth. I like your colour choices. It might be interesting to use fabric with colour gradation . Thank you, Terry. Like an ombre fabric? That would be fun. I have a bundle of blue/aqua/purple that would make a neat gradation pattern. My favorite part of the rainbow! :-) Thanks for visiting, Susan. I think I need to make this quilt! I love your colors and fabrics. I seem to be on a brown kick right now. I’m thinking a milk chocolate brown background. The design elements could be the fabrics I have with teal, orange, lime green, light blue and cream in the very busy patterns in the collection. I have always been a traditional quilter but since discovering Teresa I am hooked on the modern twist and through her I have met so many new to me modern quilters. Glad to "meet" you, Carol. It's fun that you're enjoying Teresa's modern twist. I love brown and teal together and those other colors would be a colorful combination. I don't think you can go wrong with vibrant colors. Thanks for visiting, Gail. I like the 'simple' look of solids, but I often go to louder prints. Last year it was a goal of mine to work more with solids, which I have enjoyed. But most of my fabric collection is blenders and I usually work with a scrappy assortment. I have a harder time using the "loud" prints. Thanks for visiting, Marie. 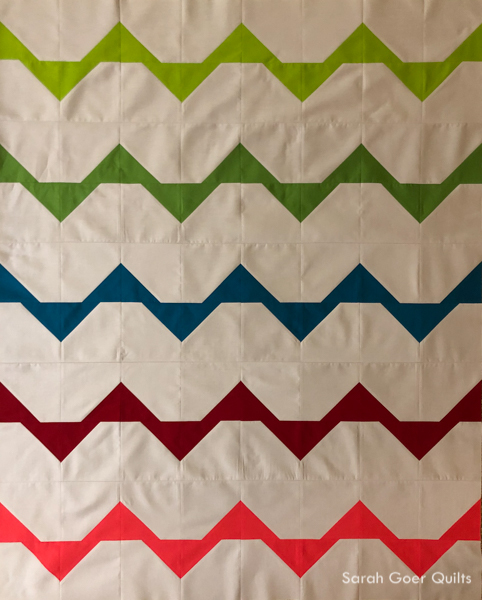 So many ways this could be done - scrappy rows of the same color, a print background with stripes of color, a quilt with just two colors - red and white or teal and yellow? 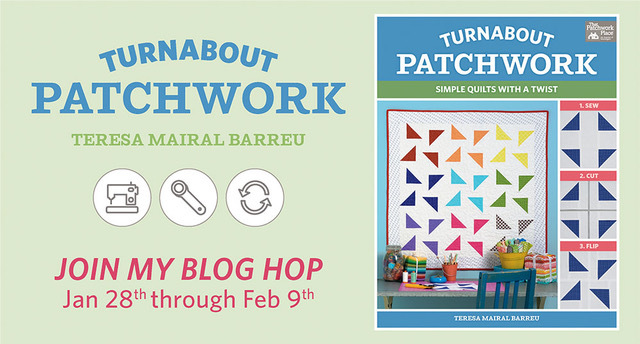 It is a very open ended pattern - looks like fun! Multiple great ideas! Thanks for visiting, Bernie. Very nice job! That will be so much fun to quilt! Thank you, Gretchen. It's a great pattern in solids for some decorative quilting. I love the solids!!! I would use a lt. Gray for the background!!! I would use Kaffe Fassett fabrics where you have the white, using various prints in one color for each row and use a solid, maybe black for the small pieces. This quilt has a lot of possibilities. This is a great plan. Thank you, Cynthia. I really love pastels so I'd probably go with soft pinks, blues, yellows, and purples. Love your quilt, by the way! Thank you, Allison. Pastels would make a lovely version. I like the idea of making it look like sand and waves. Or, a miss of brights with the corners black. Interesting ideas. Anything ocean inspired is a winner! Thanks for visiting, Sue. That would be fun. I love how I visualize a new version every time I read someone's idea. Thanks for visiting, V.
The solids are really cool! I may want to try turning the HST towards each other to make squares. Who knows? It would be fun to try. So many options with this simple block. You could just make a bunch and play with layout. Thanks for sharing your idea, Janet. I lovely choice! Thanks for visiting, Willow. I think I would like to try this with quite a bold, large-design fabric instead of the white. With the other colours being solids taken from the print. Or possibly white if the print has a fair amount of white in it. That would give it a dramatically different look. Thanks for sharing your ideas, Glory.